Nereids are mer-like, feminine water creatures that can often be heard singing. They are able to use several water spells as attacks. Netch (or netches) are large and generally peaceful creatures that resemble airborne jellyfish with the size and disposition of cattle, floating through the air supported by internal sacks of magical gases. Although male ("bull") netch are larger than the female ("betty"), and sometimes possess the ability to poison their opponents, the latter can be provoked into aggression more easily. They are usually peaceful but can be defensive of their territory, particularly during breeding season. When betty netches are afraid, they secrete pheromone oils that drive bull netches mad, turning them aggressive. 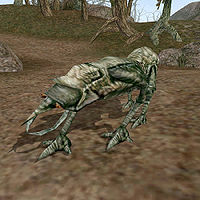 Netch are often domesticated in Morrowind, mainly due to their hides making good quality leather, although the skin contains a toxin that renders the meat inedible. While feral betties usually keep a harem of several bulls, herders often keep the female-male ratio low for faster breeding. Some wild families appeared in Solstheim in the Fourth Era, perhaps drawn by the familiar flora that had grown up in the southern ashlands following the Red Year. The jelly that secretes from their carcasses contains a harmless venom that paralyzes the nervous system. Various netch breeds exist. The most common netch breed has a blue bioluminescence and can be found all over Morrowind. The mossy netch has a green bioluminescence and can most commonly be found in the West Gash region of Vvardenfell. The rosy netch has a red bioluminescence and is native to the foyadas of the Molag Amur region of Vvardenfell. 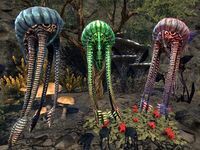 Netches are related to the Swamp Jellies of Black Marsh. Some historians theorize that the relation may be a result of the Dunmer raiding Black Marsh for thousands of years in an effort to bring back things they deemed valuable, such as slave labor, livestock,and critters. A green type of fish that can be found in Cyrodiil. 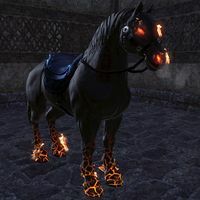 The Nightmare Courser is a Daedra that takes the form of a black, flame-wreathed horse. Many conflicting legends surround its mysterious origins, although it is associated with Mehrunes Dagon. It is sometimes used by mortals as a mount, although its chaotic temperament makes this a difficult task. Although superficially similar in appearance, the Courser bears no relation to the Hell Hound. A medium-sized predator which has been known to hunt in packs. 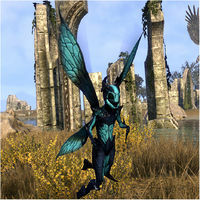 A nimble and passive humanoid insect commonly found in the Gold Coast region of Cyrodiil and on the islands of Summerset and Vvardenfell. A species of barnacles found in the waters of Skyrim. Numidium (or Anumidium), also known as the Brass God, the Prime Gestalt, the Brass Tower, Walk-Brass, and Big Walker, was a gigantic golem of Dwemer origin. Numidium was constructed by Tonal Architect Lord Kagrenac to be a new god, powered by the Heart of Lorkhan, to retake Resdayn from the Chimer and make the Dwemer race immortal. 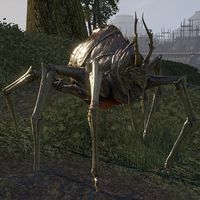 The Dwemer disappeared from Tamriel before Numidium could be activated, though their disappearance is possibly directly related to this endeavor. 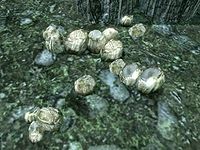 Numidium was, in practice, a weapon of devastating power; it was used by Emperor Tiber Septim to complete his conquest of Tamriel at the end of the Second Era, but was destroyed afterward. The golem was rebuilt and reactivated centuries later, and became the center of the phenomenon known as the Warp in the West, after which it was destroyed again. A second Numidium, Akulakhan, was partially constructed by Dagoth Ur a few years later. However, the destruction of Kagrenac's enchantments on the Heart of Lorkhan prevented its activation. A beautiful creature, but not without its danger. Nymphs require silver or better weapons to be harmed, have some inherent magical abilities, and drain their opponents' fatigue in addition to health. Nymphs have their own melodious tongue, which sounds similar to Ayleidoon and faerie but shares none of the vocabulary.